View from SE corner of outside toilet looking SE. Despite the early morning thunderstorm, the weather cleared up and 3 volunteers did a great days digging. 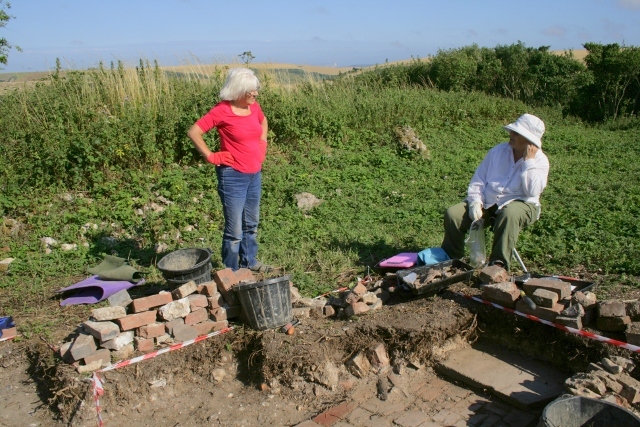 We excavated down through the demolition rubble in the north and west parts of the 2x2m grid square between the south-east corner of the outside toilet and a short distance from the front of the house. Lots more finds and features! More of the earthen path was exposed and cleaned up towards the front door. We discovered a brick paved surface, with a stone slab forming a shallow step at its far end, all edged on the west side by roughly squared stone blocks laid at an angle. 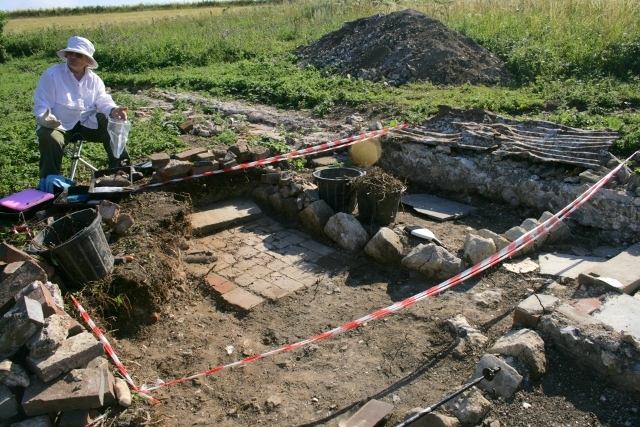 Whilst the upper part of the demolition rubble yielded few finds, the lower part of the demolition rubble revealed a relatively large number; a variety of WW2 ordnance, shards of window glass (thin older, and thicker more modern), a variety of bottle glass, a variety of ceramics, and bright blue painted wall or ceiling plaster. The military finds included the two halves of a hollow, but unfired, .303 cartridge, another – though badly decayed – screw threaded base of a mills bomb (hand grenade – see last Friday’s entry), and a screw threaded zinc safety cap for a WW2 mortar – with the words “remove before firing”. Interestingly enough, hardly any nails were uncovered, whereas adjacent areas had yielded a large number.